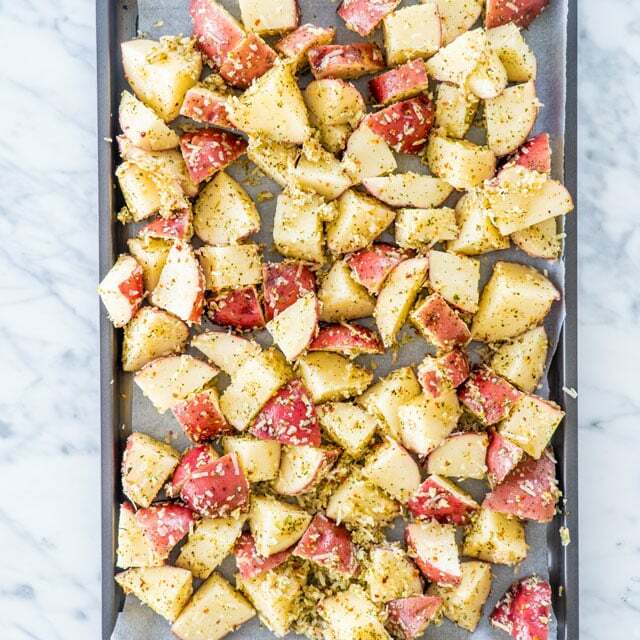 This recipe for Italian Parmesan Roasted Potatoes is so full of flavor and deliciousness. They truly are the perfect crispy and cheesy side dish! All you have to do is toss, bake, and enjoy. 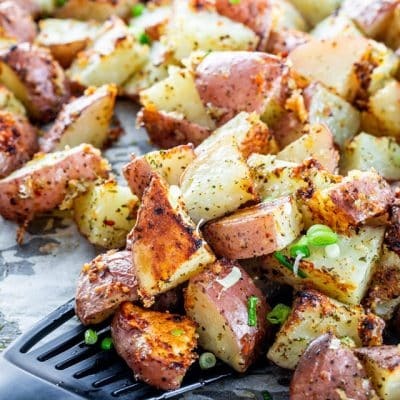 I love roasted potatoes and they really are my favorite side dish. Not only do I have them as a side dish but I also love to eat them on their own, since they are very filling. Roasted potatoes is something I grew up with, it was a staple in our house and on our table for every Sunday supper. Since I love them so much I always look for new ways to make them. My favorite recipe is still my roasted potatoes with garlic sauce but this recipe comes in at a close second. If anything I can always pour that garlic sauce over these Parmesan potatoes. Let’s face it, I would pour that garlic sauce over everything! I used red skinned potatoes for this recipe. Why? These potatoes are waxy yet firm, will cook up to be soft but will retain their shape, and pack just the right amount of flavor. I love leaving the skins on these potatoes, too! They aren’t too thick or bitter. They add a nice little touch of crispiness. You could call these the Goldilocks of potatoes. While I left the skin on and cut these bad boys into chunks, you can customize your potatoes however you like. Cut ’em into wedges, peel the skin off, even turn them into fries! I personally like the bite-sized pieces, but that’s just me. 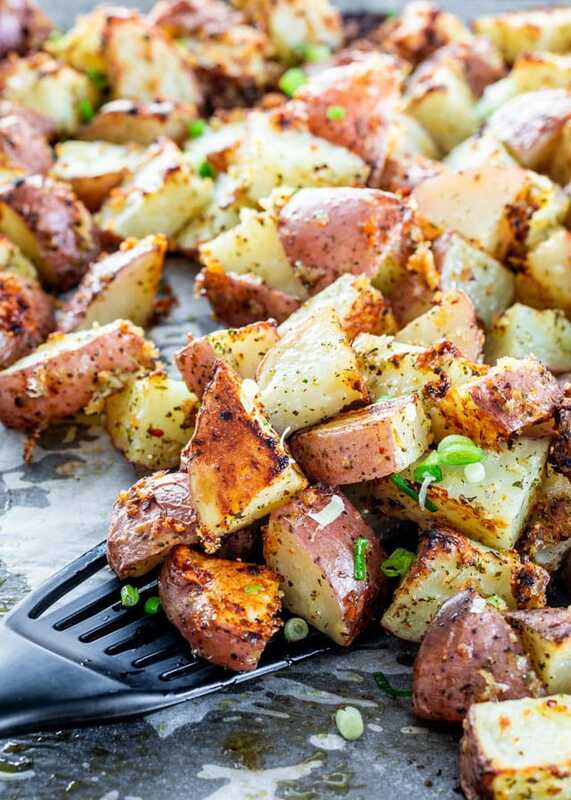 These roasted potatoes couldn’t be any easier to make and for something so easy to make you really end up with a fabulous side dish. What’s not to love? We’re talking cheese and potatoes, a marriage made in heaven, if I do say so myself. Start off by preheating your oven to 425 F degrees. I like to line my baking sheets with parchment paper or a Silpat to make clean-up easier, but a quick spritz of cooking spray will work just as well. Give the potatoes a wash and cut them up into bite-sized pieces. 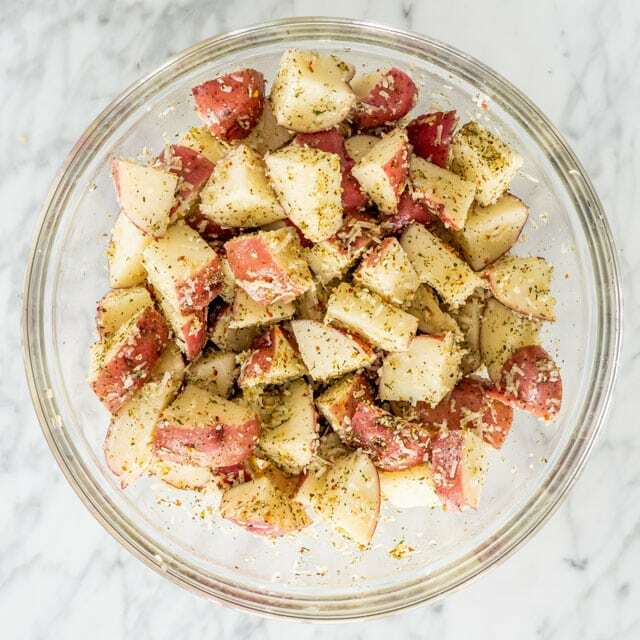 Mix the parmesan, breadcrumbs, and Italian seasoning in a small bowl and set aside. Toss the potatoes with the olive oil in a large bowl, then add the parmesan mixture. Toss well until the potatoes are evenly covered, and spread them out evenly on your baking sheet. Bake these potatoes for about 45 minutes, or until optimal crispiness has been achieved. Serve with your favorite dinner, or just eat them on their own (I won’t judge), and enjoy! I used olive oil for this recipe, but other oils such as sunflower oil, peanut oil, avocado oil, or ghee (clarified butter) will work just as well. Make sure the pan is big enough that the potatoes can spread evenly in a single layer. Wait until the oven is fully heated before adding the potatoes. I know it’s so hard once you have that beautiful baking sheet ready to go, but trust me on this one. We want crispy potatoes! Reheat these in the oven uncovered to make sure they retain crispiness. I hope you give these potatoes a try because I’m sure you’ll love them. They’re crispy on the outside, tender on the inside, cheesy, salty and incredibly delicious. These Italian Parmesan Roasted Potatoes are so full of flavor and deliciousness, perfectly crispy and cheesy! They truly are the perfect side dish! All you have to do is enjoy them. Preheat oven and prepare baking sheets: Preheat your oven to 425 F degrees. Line a baking sheet with parchment paper or a silpat. Prepare potatoes: Cut the potatoes into bite sized cubes. I did not peel them, but feel free to peel them if you prefer. If you don't peel them, make sure you wash and scrub them. Prepare seasoning: In a small bowl, combine the Parmesan cheese, breadcrumbs and Italian seasoning. Toss everything together: Toss the potatoes with olive oil in a large bowl. Add the Parmesan mixture over the potatoes and toss well, making sure each potato is coated with the mixture. Bake: Bake for 45 minutes or until potatoes are golden brown, crispy and cooked through. Storage: Store leftover potatoes in a shallow airtight container in the refrigerator for 3 to 5 days. Reheat these in the oven uncovered to make sure they retain crispiness. Recipe originally published September 2012. Updated with pictures and video. 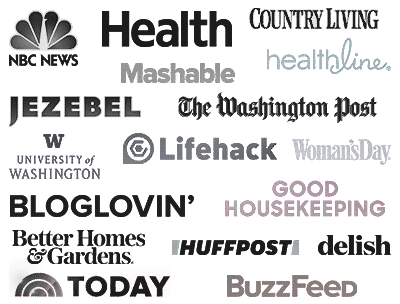 I have tried several of your recipes and I must say that they are great! I am glad to have found your site! Thank you for sharing. Thanks, Tamara! So happy to hear this! Completely delicious and very easy as they don’t mind being forgotten! Roasted potatoes are the best kind! These would be delicious alongside eggs for breakfast! I’m already adding this to my meal plan for next week – maybe Sunday or Monday! 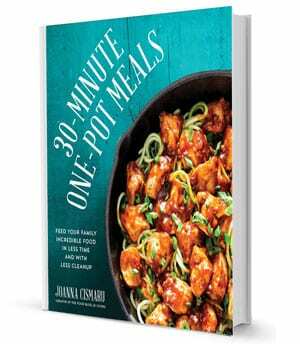 I wonder if you’ve ever tried to make these for a large group – maybe ahead of time, or in a crockpot? You can double the recipe and use a large pan to make this for a group of people. I wouldn’t make them in the crock pot- the breadcrumbs will get very soggy. Roasted is best. I just want to say I love your recipes!! Everything I have tried is absolutely wonderful!! Keep up the good work!! 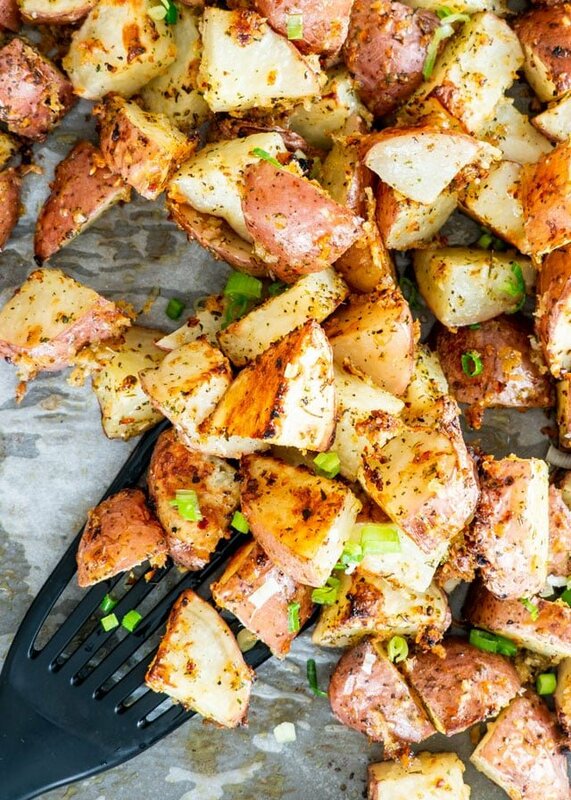 These potatoes offer so much flavor for so little effort! MAKE THEM! You’ll be glad you did. Just one time on the table and my family asks for them now. I make these EVERY chance I can. We aren’t big on potatoes but I can make a meal of these. Made these last night, and they were delicious. I added salt to the breadcrumb/parmesan mix, and I also salted the potatoes when mixing with oil. I also, in the last 5 minutes, sprinkled a little extra cheese over the top. Yum! Thanks for the great recipe. We’ll definitely be making these again! Should the potatoes by peeled? I didn’t peel them, but it’s up to you, feel free to peel them if you don’t like the peel. My daughter and I are not big red potato fans; what about substituting regular old white potatoes will this work? I just made this recipe for the first time. They are delicious. However I wish I would have salted the potatoes with the olive oil. I know the parmesan provides some saltiness, but I felt like it just needed a little assault in the base of the potato.